Sunburn is a common acute skin condition which quickly resolves with little to no treatment. We often do not give sunburn much though as a skin disease but it technically a superficial or first-degree burn. Studies have also shown that repeated bouts of severe sunburn can drastically increase the risk of skin cancer. Understanding why and how sunburn occurs is important in preventing it. Sunburn is an acute skin reaction that arises with exposure to ultraviolet (UV) radiation. Despite the name, sunburn can occur with exposure to any source of UV radiation, including tanning beds and phototherapy lamps. However, most cases are due to sun exposure where the sun is either very intense or exposure is very long. Sunscreens can prevent sunburn but its effectiveness is time-based as well as dependent on how thoroughly the sunscreen was applied. The protection factor (SPF) is also a consideration in sunburn prevention. The symptoms of sunburn usually start within 2 to 4 hours after exposure. It peaks after 12 to 24 hours and gradually subsides over days to resolve almost completely by 4 to 7 days after the burn. Most cases do not require treatment apart from supportive measures to reduce discomfort. However, the best way to treat sunburn is to prevent it altogether. This can be achieved by reducing UV exposure time, wearing a sunscreen and using protective clothing. Sun exposure is largely avoidable. It is also beneficial as the sunlight on the skin plays an integral role in the production of vitamin D. However, there is also the risk of sunburn occurring. This is a result of the UV exposure causing cellular damage an triggering inflammation. It may be extensive to the point that cells can die and genetic material may be damaged. However, most of us are not aware of the deeper and more serious injury that is caused by sunburn. In sunburn there is inflammation of the skin which occurs with any type of tissue injury. The blood vessels in the skin dilate and a host of inflammatory chemicals are released. Different immune cells aggregate in the area as a response to tissue injury. The outer skin cells (keratinocytes) experience DNA damage and die often in as short a period as 2 hours. This is followed by widespread swelling and redness of the skin that typically starts around 3 to 4 hours after injury. The occurrence of sunburn depends on the intensity of the UV source, the duration of exposure and the use of any protection which may mitigate the effects. Short duration exposure causes increased skin pigmentation (tanning). While higher levels of pigment can provide some natural protection, sunburn can affect any person irrespective of skin color. Therefore protective gear and sunscreen are the only reliable means of preventing sunburn. There are many other UV sources apart from the sun in modern life such as tanning beds, phototherapy lamps and arc lamps. Contrary to popular belief, a person does not have to be in direct sunlight on a sunny and hot day to experience sunburn. It can occur even on cloudy days in cold climates. Most UV light passes through clouds and can then reflect off surfaces such as water and snow to cause sunburn. Warmth or heat of skin upon touching. Redness of the skin which can vary from a pinkish hue to intense red color. Itching that is often not relieved with scratching and can become painful. Tenderness of the skin where pain is felt upon applying pressure. Pain on the affected skin which is worsened with pressure or scratching. Swelling of the skin which varies based on the severity of the sunburn. Tiny fluid-filled blisters in more severe cases. Non-specific symptoms such as a headache, fever and chills may also be present. It is usually more prominent in severe cases of sunburn. The symptoms of sunburn usually peak around 12 to 24 hours after the burn and often resolve within 4 to 7 days. Apart from complications such as premature aging, wrinkling and an increased risk of skin cancer, sunburn can lea to skin infections. This is more likely to occur with excessive scratching and when blisters occur in severe sunburn. Skin infections can progress rapidly and even extend into deeper tissue which may culminate in cellulitis. Antihistamines to relieve skin itching. Corticosteroid creams to reduce inflammation. 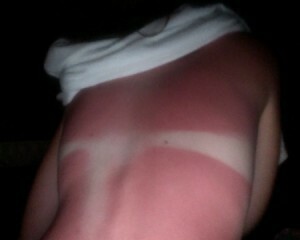 Severe sunburn needs to be assessed and treated by a doctor. Never burst blisters if present and do not use local anesthetics like benzocaine to relieve the pain as it can lead to complications. Ideally sunburn should be prevented. With increasing media exposure and awareness about the dangers of repeated sunburns, most people know the basic methods to prevent a sunburn. Wear a sunscreen during the daytime even if you are going to have limited outdoor exposure to the sun. Ideally the SPF (sun protection factor) should be above 15 and protect against both UVA and UVB. Sunscreen needs to be applied repeatedly and generously to protect adequately. Use protective wear against the sun like clothing with UV-absorbing properties. However, regular clothing will suffice. Cover up the hands with long sleeves and use a wide-brimmed hat to protect the face. Darker colors are more effective in protecting the skin. The eyes should also be protect with appropriate eye wear like sunglasses with UV resistant lenses. Avoid direct sun exposure during peak times which is usually from 9AM to 3PM. However, sun damage to the skin is possible earlier or later than these times. When intense exposure is unavoidable then use protective clothing and sufficient sunscreen. Ask your doctor about the risk of sunburn with medication that you may be using, especially medication to treat skin disorders. Some drugs can make the skin extra sensitive to UV light and sunburn will arise very quickly.